The prevalence of osteoarthritis in India is very high. 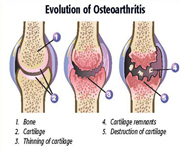 Osteoarthritis is a disease in which the cartilage that acts as a cushion between bones in joints begins to exhaust, causing swelling and pain in joints which affect negatively. Person does not move freely. The other synonym of Osteoarthritis is degenerative arthritis or degenerative joint disease. It is common since ancient time. 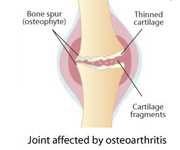 When a person suffers from osteoarthritis, there is a breakdown of the joint's cartilage. When this breakdown and wears away the bones will start rubbing together and this can cause some severe pain as well as limitations in movement and in some cases, person can not move at all. Numerous factors are responsible for the inception of osteoarthritis. It is widespread in middle to older aged people. Osteoarthritis may first appear without symptoms between 20 and 30 years of age. The symptoms, such as pain and inflammation, become visible in middle age. Till the age of 55 it occurs equally in both sexes. But after 55, women are more prone to this disease. Many studies have demonstrated that age is not a foremost factor to the start of Osteoarthritis. Many medical professionals have found that overweight may be the reason of having this disease. When a person is obese, there are more chances of experiencing some pain in the knees and in most cases; osteoarthritis develops in these areas. People who have experienced some kind of injury in the joints, either due to playing sports or through work are more prone of osteoarthritis. People who have been born with some kind of genetic condition that affects the joints in some way are also at greater risk of osteoarthritis. It is most commonly found in the hands. It is predictable that approximately four out of 100 people are affected with this disease. A current study claims that osteoarthritis is so common that it beats many other diseases in the India such as diabetes. The high frequency of osteoarthritis in India is the consequence of its prevalence among women who fall victim to it. Menopausal women are particularly prone to it. But the disease is not limited to women. Both men and women can be affected with this disease at any time. If a person is suffering from osteoarthritis, his all joints in the body may be affected. It is most commonly experienced in the weight bearing joints: knees, hips and lumbar spine. In the hip joint, the effect of repeatedly jarring the joint in some forms of athletics could be to steadily reduce the ability of the particular cartilage to absorb shock. Damage of the cartilage could take place with corresponding breakdown of joint surfaces. This incidence of osteoarthritis is found in overweight people and athletes where normal ageing has not been the reason. Physicians classify cases of osteoarthritis as primary and secondary. The primary form seems to begin by itself, with no precise cause, while the secondary type may have many causes but often results from too much tension and strain on a joint. Usually women are affected with primary osteoarthritis and may have a hereditary factor because it seems to emerge more in some families than in others. The common parts which are usually affected by osteoarthritis are joints of the hands and fingers, hips, knees, big toe, and cervical and lumbar spine. The symptoms can differ from gradual and subtle inception of severe aching joint pain, restricted movement, grating of joint with movement, painful bony growths in the finger joints to joint pain in wrist, knee, foot, elbow, low back pain and sometimes joint inflammation. If a person is under grip of osteoarthritis, he must not delay the treatment. If he takes proper treatment timely, then he will be relieved from pain and improves function. Researchers are continually determined for various ways of controlling and curing the disease. Appropriate home exercise treatment is recommended to maintain joint and overall mobility. Exercises in water are often effective for increasing mobility. Heat and cold treatments, protection of the joints, the use of self-help devices and rest are all recommended. Good nutrition and careful weight control are important. For overweight persons, weight loss will decrease the mechanical strain placed on the joints of the lower extremities. Person with good lifestyle changes may r limit osteoarthritis symptoms. It is suggested that if women make effort to reduce weight, it may lessen the risk for osteoarthritis in the knee. It is always recommended to do regular exercise. It may help to build up the muscles and potentially stimulate cartilage growth. Person must keep away from high-impact sports. By regulating diet, person can alleviate the symptoms of osteoarthritis. Antioxidant vitamins C and E may provide some protection. Vitamin D and calcium are recommended for strong bones. Note: This information is just for knowledge of disease. If such type of medical condition develops, consult your doctor.